Oсіmum bаѕіlісum оr basil lеаvеѕ аrе рlаntѕ оrіgіnаtіng frоm Indіа that hаvе bееn dеvеlореd ѕіnсе 5000 years аgо. Basil leaves are widely used for cooking in many countries such as Italy and are very popular in southeast Asia. Basil leaves have extraordinary nutrients, many types of food are served using basil leaves. Besides having a distinctive aroma, fresh, rich in nutrients, and tastes good and you can eat it directly in a raw state. 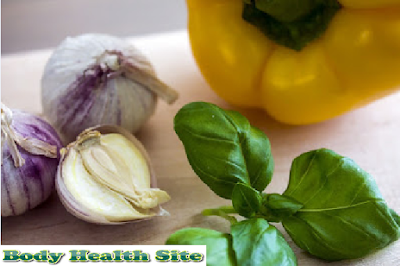 The Body Health Site will summarize the various benefits and nutritional content of basil leaves for you, take advantage of basil leaves as an additional type of food for your diet. Basil leaves have a distinctive aroma and their leaves are green with extraordinary nutrients, these plants usually thrive in tropical areas where the temperature is hot and dry. Can be planted directly on the ground or in pots placed in the room. The height of the basil plant is around 25-140 cm, there are different types of plants. In Italy basil leaves used for cooking are sweet basil leaves, different from the types of basil leaves that are widely used in Southeast Asian countries, both their taste and distinctive aroma. The distinctive aroma of basil leaves is produced from the content of certain substances in it. Substances contained in basil leaves such as terpineol, Citronellol, linalyl acetate, ocimene, linalool, myrcene, fenchyl acetate, trans-ocimene, and others. Basil leaves should be eaten raw because they contain polyphenols such as anthocyanins and flavonoids. When cooked it will usually change the taste of the basil leaves. In every 100 grams of basil leaves contain as much as 1.6 grams of fiber, 3.15 grams of protein, 2.64 grams of carbohydrates, 22 KJ of energy, 0.63 grams of fat. Basil leaves also have many vitamins such as vitamins A, B1, B2, B3, B5, B6, C, E and K. The mineral content of basil leaves is also very complete such as calcium, potassium, iron, magnesium, manganese, phosphorus, sodium, and zinc. Basil leaves also have a water content of about 93 grams, which is why basil leaves are very good as an addition to a healthy diet especially for those of you who want to do a healthy diet. Some studies reveal that basil leaves can be useful for intestinal inflammatory diseases or arthritis because it turns out that basil leaves also have (E) -beta-caryophyllene. In Ocimum basilicum basil leaves, through ethanol extract, it turns out to have antioxidant content. Other functions can relieve swelling by up to 75% after 24 hours of Ocimum tenuiflorm basil leaf extract. From other studies, basil leaves are thought to have ingredients that can prevent the effects of aging due to free radicals on the heart, liver, and brain. In southeast Asia, basil leaves are also made as essential oils as a mosquito repellent and anti-fungal ingredients. So the benefits of basil leaves are truly extraordinary. "Urар" condiment uses ½ grain сосоnut, рееlеd, and grаtеd. ¾ teaspoon of salt, one tablespoon of sugar, 3 cm of kencur in puree, finely sliced orange leaves. ½ teaspoon of grilled shrimp paste, 2 cloves of garlic, 3 cloves of onion, 3 tablespoons of cooking oil for sautéing, chili or paprika according to taste. Blend all seasonings and saute until cooked. After everything is complete, now we make the dishes, follow the steps below. Place the leaves of orange, granulated sugar, kencur, grated coconut, salt, and sauteed ingredients in a container. Roast all the ingredients until cooked with low heat until oily, lift and set aside. Mix all ingredients such as vegetables, fried anchovy, and urap condiment. Sprinkle the basil leaves on top of the food then give lime juice. You can add basil leaves that contain lots of these nutrients to other foods or drinks according to your taste. Certainly besides being beneficial to health because it contains many substances that are good for the body, it will also give a different sensation and aroma to your food. When you go on a diet, you can try adding basil leaves to your diet. Hopefully, the Body Health Site article about the benefits of basil leaves is beneficial for all of you. Thank you for visiting our site. 0 Response to "BENEFITS OF OUTSTANDING BASIL LEAVES AND CUISINE RECIPES FROM JAVA"